CMPopTipView is simple to use. Just initialise it with a target view, a container view and a message to display and it handles positioning itself with the container view to point at the target view, sizing itself to fit the text. It is also smart about UIBarButtonItems (in either navigation or tool bars) and can position itself properly to point at them. Some example code is shown below. 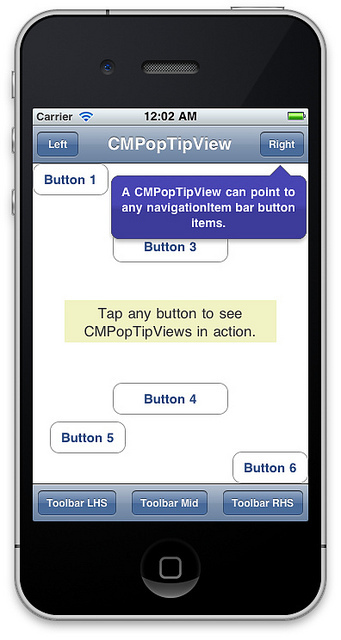 CMPopTipView draws itself using Core Graphics and so scales up nicely to the high resolution Retina display with no extra work. It might be a useful reference for iOS developers looking for Core Graphics drawing examples. The code demonstrates how to draw the path of a custom shape, how to draw a gradient fill within a clipped path, how to apply a shadow to the shape and how to draw text within the shape. A universal (iPhone/iPad) demo app is included with the source code. It is a button-fest of popup tips, as shown by the screenshots. Can I use this source for My free app? Skycream: sure, this project is open source under an MIT license. See LICENSE in the project source. That's what I need. But we should produce UI that never needs a helping popups. Thanx a lot for ths amazing blog. I am trying to display the UIPopover as left arrow and right arrow on basis of this post. can You help me for that. Hi KamalHarariyA, currently it only supports arrows pointing up or down. Patches welcome for adding support for left/right arrows.